It&apos;s those early morning encounters where you can see the frost on their backs and watch their breath fog the air... or that once in a lifetime moment when you can no longer feel your fingers or toes, the frustration is mounting, and then a giant, mature whitetail steps out from behind a tree into the light of the rising sun, and your breath catches in awe... that&apos;s what deer hunting is to me. Those moments of beauty and excitement that you&apos;ll never get while sitting in front of a tv, or create with imagination from the pages of a magazine. Kansas is world-renowned for record-setting deer, and hunters from across the globe come in search of legendary hunting opportunities. Kansas&apos; vast landscape is dotted with wooded areas and shelter belts providing lots of cover and protective habitat for quality deer herds. In addition, farm fields are abundant with corn, beans, and other crops, and areas of protected grasslands help ensure that the whitetail population here thrives. The state of Kansas has gone to great lengths to ensure hunting opportunities for everyone, especially bow hunters. Archery season usually spans four months, this allows bow hunters the opportunity to hunt deer still in their summer patterns, spanning through the infamous rut season, to after rut when deer activity starts to slow and they prepare for the colder, upcoming months. While any type of hunting is a wonderful excuse to get out into the great outdoors, bow hunting provides once in a lifetime opportunities to get close, and become part of the natural habitat of the deer you&apos;re hunting. If you&apos;re looking for awesome deer, gorgeous scenery and amazing hunts, Kansas is the place to be! 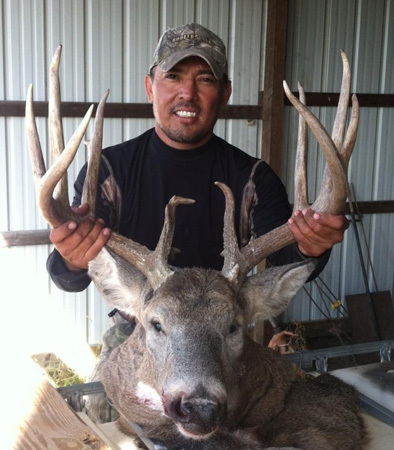 Pictured above, Alex Tagle (@huntingfreakz on Twitter) shows off a good looking buck.